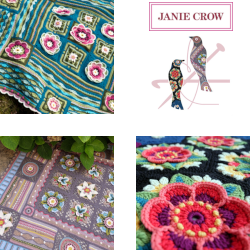 If you like very clever knitting, I think you are going to really enjoy Episode 75 because we feature two exceptional guests who have very clever and geeky minds. 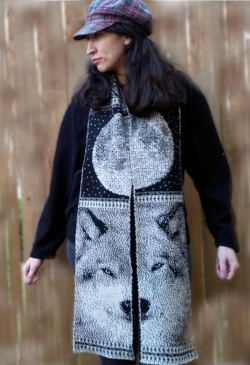 They have put those minds to work in the field of knitting with amazing results. 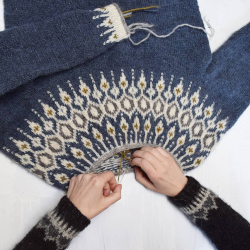 On top of that we have the usual update of our projects, we’re announcing a new KAL and there are two mini tutorials on ‘Mending Your Knitting’ from Andrea. It’s a full program. 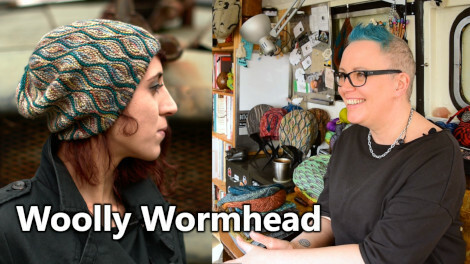 First off is our feature interview with the exceptional hat designer Woolly Wormhead. 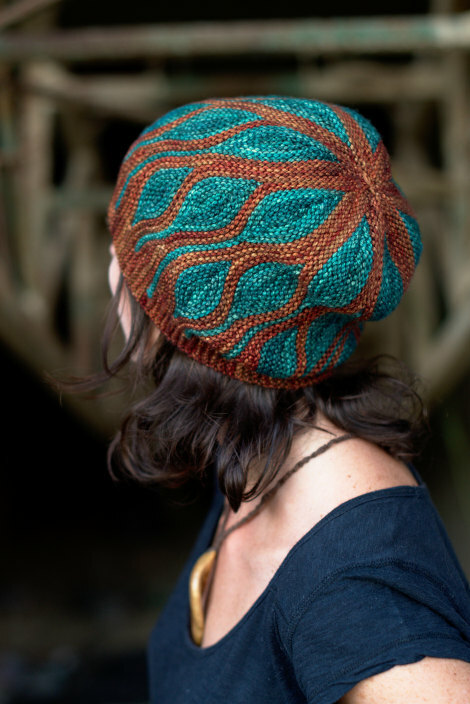 Woolly’s designs are totally stunning to look at, but they also have a real beauty in their mathematical structure that flows right through the construction. 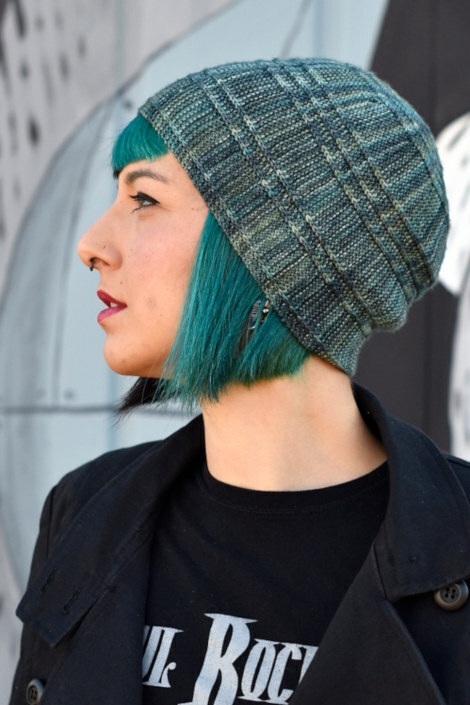 If you are somebody who thinks that hats don’t suit you, Woolly is going to change that. 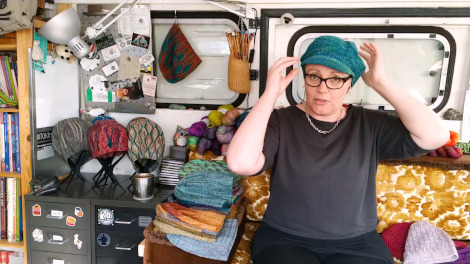 During the interview Woolly gives us her special ‘Hat Clinic Workshop’, where she show us that there is the right shaped hat for every shape of head and face. Woolly is living a very interesting life. 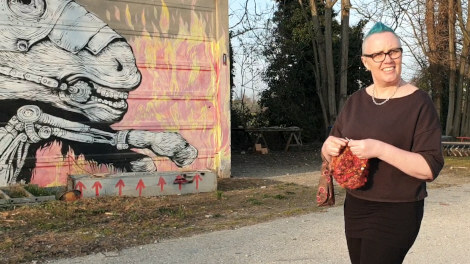 She and her family (husband and boy) are living in Italy in an artist and traveller community known as Mutonia. They live in a 40 year old double decker London bus and Woolly’s studio is two WW2 German army trailers that are joined together. The interview takes place inside the German army trailer and you will also see Woolly walking around the community where there are lots of murals and sculptures. It’s a fantastic interview, so enjoy! 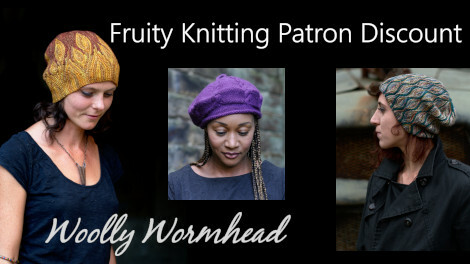 Woolly is offering Fruity Knitting Patrons a 25 percent discount off all of her self-published patterns. Offer is valid until 7 May 2019, full details available here. 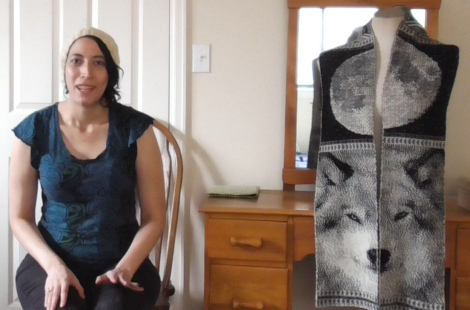 Our second clever and geeky guest is Celia Cabodevilla, who features in our ‘Knitters of the World’ segment. 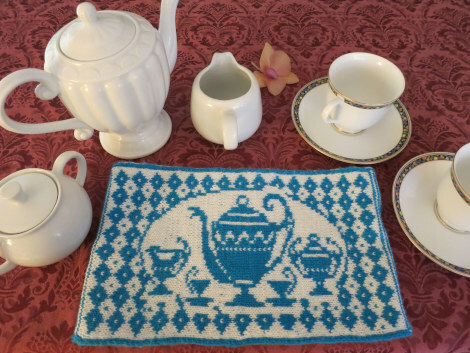 Celia specializes in double knitting accessories. 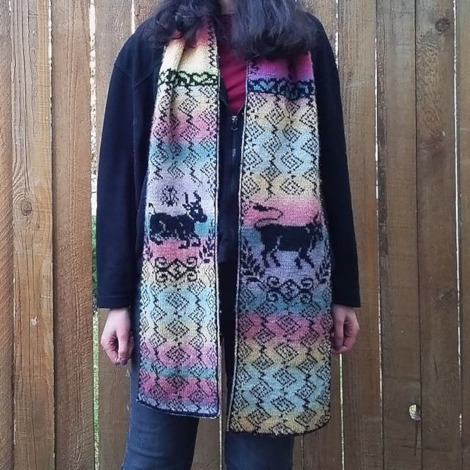 She combines her previous work of creating pixel art for video games with her love of Ancient greek myths, Cherokee fables and classic western literature. 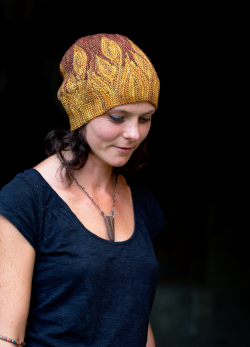 This all results in the most gob smacking double knitting designs. Celia definitely has a bizaar and intoxicating mixture of inspiration sources, also including 18th century embroidery patterns, and astronomy (I forgot to include them in the list above). She combines them all together brilliantly and also tells a very good story. 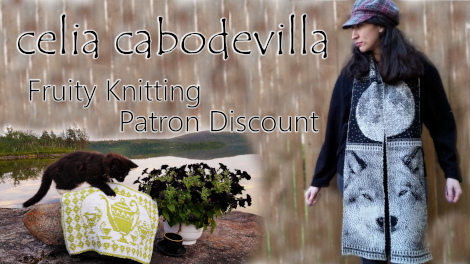 Celia is offering Fruity Knitting Patrons a 40 percent discount off her self-published patterns. Valid until 7 May 2019, full details here. Thank you, Celia! 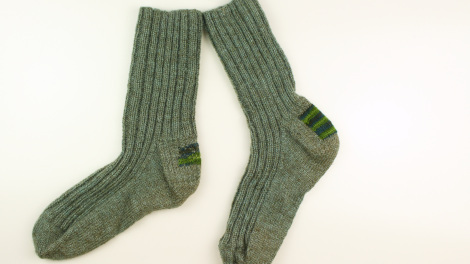 Andrew spent many hours knitting this pair of socks for me and after about 4 wears I have a hole on the back heel of one sock and on the other sock in the same place it is worn very thin. So I’m going to show you two different methods of repairing these areas. These two methods of repair, create a very neat finish and can also be used to repair worn out areas and holes in more visible places than the heel of a sock. Primarily my goal is to reinforce the weak areas on both socks so they will be strong and be able to handle a lot more wear. I’m not concerned with making the repair invisible because it will be inside a shoe and won’t be seen anyway. Therefore, I’ve chosen a yarn that is stronger than the original yarn because I want the repair to really last. Andrew is wearing his modified Traigh by Jade Starmore. 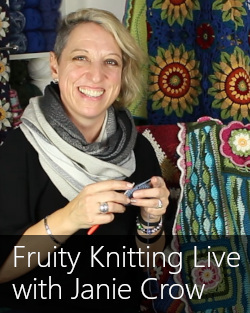 I live in NZ and I have only just recently ‘discovered ‘ Fruity Knitting…I LOVE IT!! You pack so much into your podcasts. 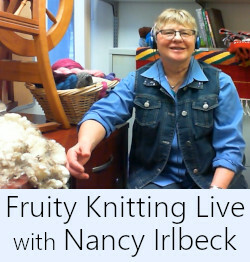 I have been knitting for over 40 years on and off but watching your podcasts is inspirational and has taken my knitting to the next level. You obviously work tirelessly to produce each amazing episode…I am addicted. I’m loving working my way through all of them right from the beginning. Thank you both so much…please keep up your incredible work. Thank you for your kind words and support, Lynn. A + A.